When you move the grip over to the belt buckle you are taking loft off of the clubhead. Do not panic about this because you are only taking three or four degrees off. If you think the club will not have enough loft for the shot after you take the loft off, simply change clubs. You can use a GAP wedge instead of a pitching wedge, you can use a sand wedge instead of a GAP wedge and you can use a LOB wedge instead of a sand wedge. With the golf ball positioned anywhere from the center of your stance to the left heel and 70% of your weight on your left heel and the grip of the golf club across from your belt buckle it is time to swing the golf club back. Because you are in this position the golf club will swing up in the backswing. You have done everything possible to make that happen because the very reason you want the golf club to go up is so it will come down. You know the old adage, what doesn’t go up won’t come down. As the golf club swings away from the ball in the backswing and begins to climb up the clubhead will arrive at the top of the backswing (whether it is a small pitch shot or longer pitch shot) in a position that will allow the leading edge of the golf club to swing down into the ground and the bottom of the golf ball. If you can create this angle, the golf ball will climb up the clubface; begin to spin backwards and with the amount of clubhead speed the golf ball will go up at the moment of impact. If you setup for a pitch shot like this you could experience digging the leading edge into the ground too much. If you move 70% of your weight onto your left leg then you only have to move the grip a few inches to match up with your belt buckle so don’t exaggerate this too much. Ok, that’s the setup for a pitch shot well and truly covered. In the next pitching lesson you’re going to discover what is needed in the backswing for successful pitch shots. About The Author: This article was written by professional Bobby Eldridge. Bobby has been teaching golf for over 35 years and over that time he has given over 40,000 golf lessons. 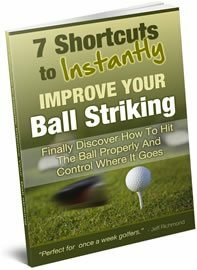 Bobby has produced a great Pitching DVD that shows you in simple terms how you can hit great pitch shots from anywhere. 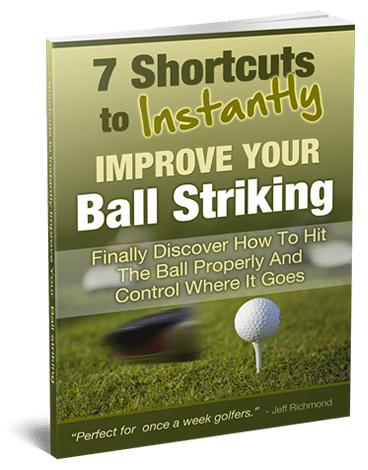 So to improve your pitch shots so you slash shots from your golf scores click here to find out more about the Pitching DVD.